It's not easy to make Christmas happen all year long! But they manage to make it happen at Santa's Workshop, and they do it with a smile and plenty of Christmas cheer! Santa's head helper, John Collins, was kind enough to take some time out of his day during this very busy season to give me a behind-the-scenes tour of the property. 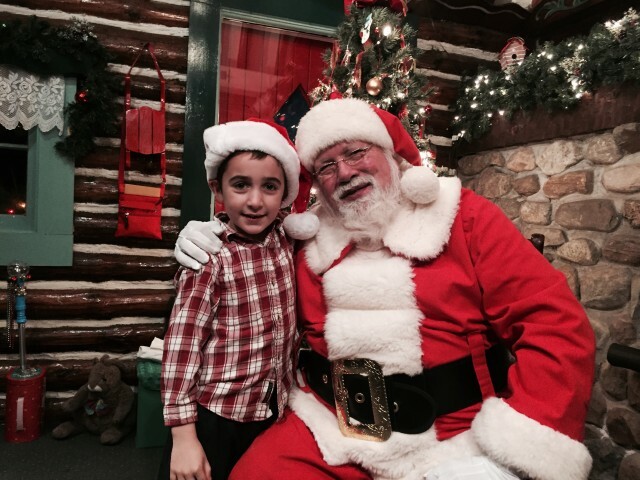 He told me all about what it takes to spread Christmas cheer year round for all to hear. Santa Claus, the bringer of gifts, the all-seeing list keeper, the man of the hour — he lives at Santa's Workshop, in North Pole, NY, all year. Families can visit him most of the year, but he takes some time off in October, and then January through June. And of course, he's busy on Christmas Eve and Christmas Day delivering toys to boys and girls all over the world, so the park is closed. Santa has been bringing toys to good children for many, many years, but he moved to Santa's Workshop in 1949. Lake Placid businessman Julian Reiss told his daughter a story about a baby bear who stumbled upon Santa's house and the North Pole. His daughter pleaded to visit the place, so Julian decided he needed to turn it into a reality. He partnered with Santa, imaginative designer Arto Monaco, and Harold Fortune to build Santa's Workshop and make it a place for Christmas-loving kids to visit with their families. Unfortunately, I didn't get to meet Santa because he was busy prepping for the upcoming holiday, so I'll have to go back and tell him what I want for Christmas soon! There are actually 12 reindeer at Santa's Workshop. Santa has some alternates so he's always ready to go on Christmas Eve. Most of them are three to five years old, though there are some one-year-old babies and some older ones. The reindeer are regularly checked by veterinarians and get all the shots and other care needed to keep them healthy. They prefer the cold this time of year to the warm in the summer, though summers stay cooler here than in most places. They are fed each morning, and throughout the day, a mix of alfalfa, grains, hay, and other foods that are nutritious for reindeer. This time of year, you might find them with snow on their noses, like Comet and Blitzen did when I saw them. That's because they're digging through the snow to get to the grass below for a tasty treat. When families are visiting Santa's Workshop, most of the reindeer hang out at the Reindeer Barn, but much of the rest of their time is spent in one of the three pastures around the outskirts of the park. There they graze, play, and train to fly through the air carrying Santa's sleigh. Right in the middle of the park is the actual North Pole: a thick, white pole jutting up from the ground that stays frozen all year, even in the scorching July sun. How does it work? Just like an ice rink! There is a freezing unit in the middle of the pole, and coils keep it frozen even when it's hot out. This time of year, of course, it gets an extra layer of ice and snow. Beyond the pole is the outdoor Yuletide Theater amphitheater, where the Mother Goose Guild performs most of their acts. The Mother Goose Guild consists of characters like rag dolls Sam and Sandy, Miranda Mouse, Frosty the Snowman, Rowdy "the Rascal" Reindeer, and Chris Moose. There's also magicians, ventriloquists, and other fun acts. The performers rehearse for about three weekends before the park opens at Christmastime, and about the same in spring before the summer opening. They put on shows throughout the day at the outside Yuletide Theater, ranging from a nativity pageant to a country-style jamboree. They also perform puppet shows in the Jack Jingle Theatre (where there's also a space for kids to put on their own puppet shows). Many of the employees come back each year, from the performance cast and throughout other areas of the park as well. The attraction is a significant employer in the area. Did you know there's a talking tree at Santa's Workshop? Tannenbaum the talking Christmas tree will chat with kids when they walk by. You may think it looks like an animatronic figure, until he clearly identifies you as you walk by: "Hey, young man in the blue coat! Why are you walking by me without saying hello?" Tannenbaum sleeps most of the time, but when kids are nearby, he wakes right up and has a chat. There are seven rides at the park, and they are all geared toward kids. For many of them, you have to be 48 inches or shorter to ride, though there are a few that the big kids can ride. The train and the carousel tend to be the most popular. The rides do work in the snow, but there are certain weather conditions that they can't operate in. Between the summer and winter seasons, and again in the spring, the rides are all rehabbed to make sure they're safe and attractive for visitors to the park. Besides all the other fun that families can have at Santa's Workshop, Santa wanted to make sure kids could take home a little something to remember their visit. During the park's off-seasons, Santa's Helpers spend a lot of time stocking the stores back up so there are plenty of things to choose from. There are several interactive stores throughout the park where they can pick up a souvenir. There's a blacksmith, who can make a personalized reindeer shoe; a candle maker who makes candles on site; a toy shop, where kids can choose from a few options of toys that were popular when Santa's Workshop was created; and a hat store, where kids can have a hat made with their name on it. There's also a candy store, where Santa's Helpers make much of the candy right on site. They go through tons of candy each year that keeps boys and girls smiling the whole way home. One of the coolest things about Santa's Workshop is that he has his own post office there. Visitors can send a letter from the post office and use a special cancellation stamp just for the holidays. (Or they can get a normal cancellation stamp, but why would you want to do that???) This year's is pretty fun. You can even have Santa send a letter to a friend from there! 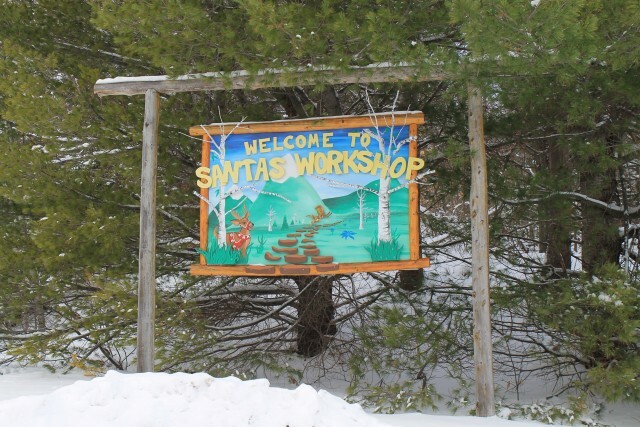 Santa's Workshop has a few opportunities for families to visit this time of year. 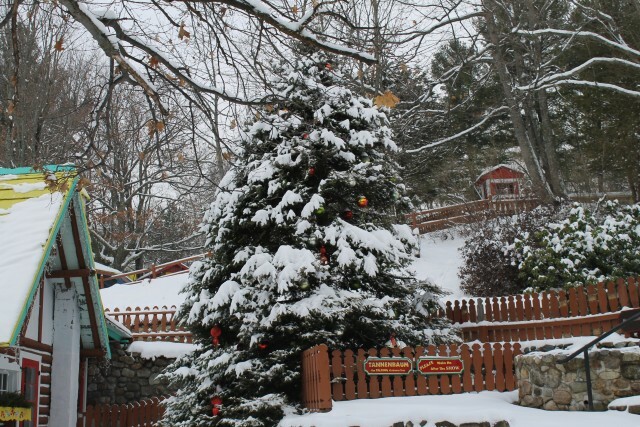 Their Yuletide Family Weekends this weekend and next are incredibly popular. They include a lodging package and meals, and Santa and his helpers will even come to the motel or other lodging property where your family is staying to spend time with you for dinner. Those weekends book up super early — the lodging packages for the two remaining weekends are already booked, and families are already booking for next year! But there are still plenty of opportunities to get your full dose of Christmas cheer. The Village of Lights runs this Sunday and next, and then again each night the week before Christmas. Visitors can take advantage of all the park's amenities — unless the rides are closed due to weather — and enjoy the sparkle of tons of tiny lights throughout the park as performers sing festive songs and Santa hears the wishes of little girls and boys.